As they say in the BW article, this means a lot of big private or nationally contained companies missed out on the list. That said, in the list of 100 brands (topped again by Coca-Cola) there is not one travel company. I might be being narrow in my definition as the list contains Disney at number 10 and American Express at 22 but these are not pure play travel brands like a major US or Euro carrier (American, United, Continental, BA) or a mega chain (Hilton, Starwood, Marriot). I am trying to figure out why that is and what that it means. Despite travel being (by many measures) the largest industry on the planet and despite what feels like every other advertisement I see being from a travel company, according to Interbrand niche but high profile products like Ferrari (88th) and Moet & Chandon (82nd) are more valuable brands than the long list of travel companies that we could all debate as the biggest brands in travel. We know that travel brands are well known – by that I mean recognised by consumers in prompted and (more importantly) unprompted awareness tests. We also know that there is a degree of brand loyalty in travel as evidenced by frequent flyer programs and flag carrier love ins. Though the first kind of loyalty (frequent flyer programs) is a “bought” loyalty and the second (flag carrier) is often tied to misplaced jingoistic behaviour. The reason for travel being missing from Interbrand’s list is therefore clearly not a “recognition” factor. The main test in the BusinessWeek/Interbrand survey is the significance of the “earnings derived from the power of the brand…the brands effect on earnings relative to other…assets”. For the travel brand builders this means that BusinessWeek thinks that these 100 brands get dramatically better sales bumps just from their brands than the equally as well known travel brands. That the recognition and awareness of travel brands does not translate as much into sales assistance as for equally as recognisable non-travel brands. If this conclusion is right, then we need to think about why this is and whether or not this means that travel companies are worse at marketing than we thought. Or - is there something about travel that makes it harder to build a brand that in tech, fast moving consumer goods and luxury brands (the majority of the list). In analysing this I turned to thinking about the brand battle between Coca-Cola (ranked 1st) and Pepsi (ranked 23rd). Each throws hundreds of millions of dollars at marketing products with subtle but not extreme differences (much - dare I say - like a lot of travel products). One theory is that the travel consumer is more fickle than the cola consumer (as a proxy for most fast moving consumer good) because they have more options to choose from and given the high cost more reason to change supplier. Clearly there is some loyalty within the travel consumers but I consider it more like a “basket of loyalty” rather than a dedicated loyalty. That is, consumers have a basket or collection of brands in their minds and are open to buying any product in that basket. For example I will fly to Europe on any of Qantas, Cathay, Singapore, BA and Virgin. Sure I have one that I would like to fly more than the others but for a specific trip the decision point between these brands is price and schedule. Which one is cheaper and at the right time. With Coke and Pepsi schedule and price are not issues. There is usually no shortage of supply (schedule) and price is usually equal between the two products. In the case of the luxury brands like Ferrari price is still not an issue as people are not choosing based on price and schedule/supply is not an issue (if you want one and can pay for it they will get you one). The question is then, can a travel brand break out of a consumers “basket” such that it can develop the same psychological hold on a consumer that a cola, luxury or soap brand can. A hold that can overcome the price and schedule/availability advantage that another brand has in the basket. I can’t think of one and therefore understand why there are no travel brands in Interbrand's list of top 100 global brands. Can you? hardest thing in business i reckon is to create brand. Basically i have no idea how to do it. pheww – look! you can refer to all the branding booking and principles you like (al ries in origin of brands (great read), of course good to great, brand bubble or most recent I started to read "borrowing brilliance" (will be a goodie). like i said i have basically no f&8#in! idea, but i have a suspicion you have to actually identify a problem, understand the problem adeptly, then come up with a relevant solution (that people may not even know they need). After that, then get the word out via the press & wom and fingers crossed you become synonymous with that solution! sounds easy hey? Well i reckon that’s basically it in theory. Putting the ingredients together to get it to work is another story. Though as an entreprenuer if you don’t achieve this (that includes me), no matter if you make a profit, i reckon you've failed in the scheme of brand building. i guess all i can say is dont give up til you resolve a problem that is significant enough. @Steve S - great comment. my opinion....specifically related to the examples you provided. the difference is a fundamental one in industry structure due to consumption patterns. your examples, coke and ferrari, are both poster-children for naturally evolved oligopolies, whereas travel (especially where the 'big brands' play in the 3.5 to 4.5 star categories) is a much more crowded playing field. there, the industry has evolved much more 'perfect competition' style and therefore no individual can make their way to the fore. In my opinion there are to many smaller brands in travel. Also, adding value to the product offering rather than just price is key. I'm no expert on branding, but it would seem that any brand loyalty has to be based on gaining trust around core personal values, not just an in your face, continual bombardment of a message, logo, and slogan. Perhaps in this day and age there are bottom line financial factors that travel brands aren't able to transcend to create brand loyalty, such as fuel costs. My bet is that the first travel brand to embrace a triple bottom line philosophy and lead the industry in sustainable business practices will have the best shot at cracking that top 100. 5% of consumers are truely brand loyal. The other 95% are habitual. "I travel Qantas because I travelled with them previously"
"I walk into Flight Centre because I walked in there last time"
Our task is to either re-inforce the habit by timely stimulation. As a competitor we need to find away of appealling to the consumer that provides them with a quantifiable reason for breaking the habit. 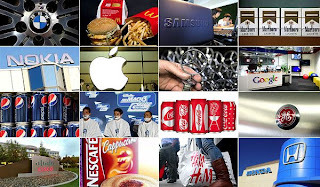 Brand strenght is also an approximate measure for market share, meaning that broadly speaking and with some exceptions, larger companies in a sector have also stronnger brands. The travel sector is too big and too diversified for one brand to have a significant share of the market; the leading company in air travel is not the best in accommodation or packaged tours and so on. So I think it's much harder for a travel business to get recognised internationally and across multiple sectors within the travel industry. Furthermore, the travel purchase is a more engaged one than for other consumer products. It's more important to chose a trip than a cola and my choice will depend on many factors including customer service, price, convenience of airport, feedback from friends, time available, etc. ; for a cola I am influenced only by taste and to a smaller degree by the brand itself. Said that, I hope one day to build that travel company with a huge brand. How about Virgin Atlantic? OK, it's not a global brand, but it is the only travel brand I know of where customers are willing to do a trade off in the price/schedule dilema for the unique brand experience - at least in the UK! The travel business has created a model that dares its customers to beat the system. Airlines create fare rules, surcharges and ancillary revenues that challenge the traveler. To say nothing of near monopolistic hubs that limit customer choice. Hotels have loyalty programs that lock guests in, ever changing rates and rules. OTA's have created an environment that encourages relentless shopping for the very best deal. Countless columnists and bloggers advise us how to beat the travel companies at their own game; making the travel purchase experience little better than buying a used-car. Travel companies will not gain value from their brands until they primarily focus on customers and genuinely seek to sustain and grow long-term relationships. For now most travel businesses fail to look beyond short term metrics and pay scant attention to brand and customer.